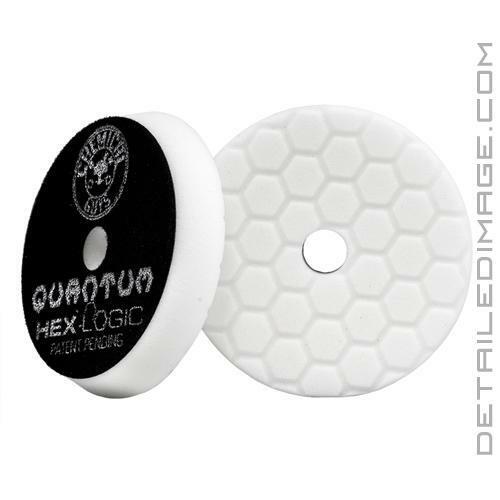 The Chemical Guys Hex-Logic Quantum Buffing Pad White is a light polishing pad that will help remove light to medium imperfections from your paintwork. Imperfections can take away from the overall gloss, depth, and clarity in the paint. If you have any light imperfections, spider webs, etc. polishing is your only way to restore that like new shine we all strive for. Pair this pad with your favorite light to medium polish and watch the easy removal of these imperfections right before your eyes. If you have any heavier imperfections, the other Hex-Logic pads (listed in the chart below), would be a better choice. Chemical Guys Quantum Hex-Logic Buffing Pads feature a high quality foam that allows you to smoothly transfer power from the machine to the paint, while minimizing heat, wear, tear and user fatigue. The secret is in the hex logic grooves and center hole. The hottest part of the pad during use is generally the center, meaning if you remove the foam from that area, you will allow the pad to breathe and thus become cooler. 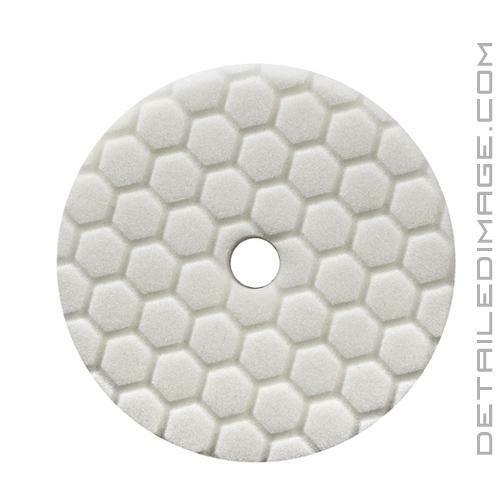 Combine that with the hex grooves, which help disperse heat from the face of the polishing pad, and you greatly reduce heat buildup during use. Less heat means better polishing results and less polishing pads prematurely failing! The Race Face tapered profile increases pad surface area and stability, which helps reduce wear and tear while polishing. Add in the breathable hook and loop backing, which is designed to help reduce heat, while securely fitting onto your backing plate, and you have yourself an incredibly high quality and effective pad design!